Annapurna Circuit has made it to bucket lists since the time it was opened for trekking in the 1980s for all the right reasons. The horseshoe trail has more to offer than you’d imagine you are ready to receive. Here, we take you on a short journey of what’s awaiting you on the other side of making that decision of opening yourself to a whole new experience. The adrenaline rush of making it to Thorong La Pass at 5416 meters. The experience of walking through the world’s deepest gorge, Kaligandaki Gorge. Trust me, it’s breathtaking. Living through a plethora of diverse cultures, landscapes, villages, and settlement. Starting off at Besisahar, Annapurna Circuit Trek takes roughly about 2-3 weeks to complete and it’s a journey you’d never want to miss. Annapurna Massif forms a ridge of about 48 km (30 miles) between the Kaligandaki Gorge and Marsyangdi River, towards the upper town of Pokhara. The massif contains four main summits, out of which two – Annapurna I and II stand towards the western and eastern ends and III and IV lie right between them. The snow-capped MacchaPucchre, elusive and pristine, is a sight to behold because of its shape and the stories behind it. And Mt. Dhaulagiri (Sanskrit translation. White beautiful mountain) lives up to its beautiful name. 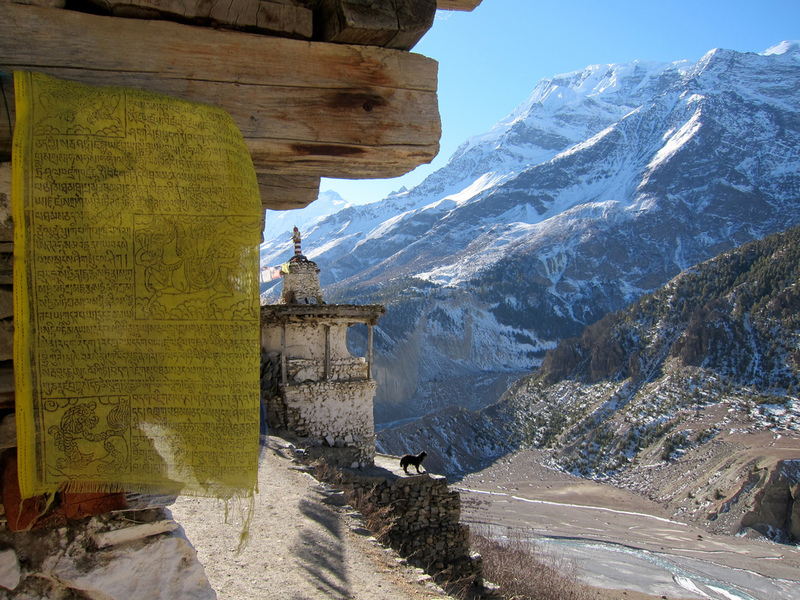 Annapurna Circuit is the most diverse trek you could take. Whether it’s the landscape, the culture, the people, the view or just how you feel. Starting off at rice farms and forests you reach the height of 5416 m and then the depth of 5571m lower than Annapurna I at the world’s deepest gorge. In terms of culture as well, along with Buddhist chants that dominate the region, there are slight traces of Hinduism, giving the whole trek a slightly different vibe. Also, there’s the famous Muktinath, considered holy by both Hindus and Buddhists, a symbol of harmony. And it doesn’t end there, witness up to 440 species of rare birds and animals such as blue sheep, red panda and snow leopard. Each and every stop at the Annapurna Circuit is a local teahouse where you will meet the friendliest people ever. The hospitality warms your heart and your memories for years to come. Take a dip or two in hot springs on your journey as well. Relax and watch all your fatigue melt away in these springs. To sum it up, the trek to Annapurna Circuit is a journey that will renew your body, mind, and spirit through its elemental beauty. Feel the vibrant culture, taste the local flavor and witness the awe-inspiring mountains in their infallible reign.